We're serious about recruiting, the proof is in our 2012 recruiting board. Make one thing clear, Kyle Kalis is not Justin Boren. 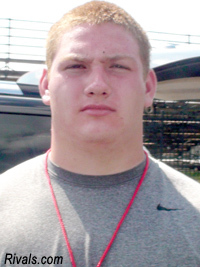 Okay, now that that is out of the way, let's welcome the once Ohio State commit turned decommit Kyle Kalis to the 2012 Michigan recruiting class. Ohio State fans are coping with this huge loss the way you would expect them to...by rationalizing that he was never truly 100% committed to OSU in the first place, and that UM really didn't "steal" him away. That may be true, but I would argue that had he remained committed to OSU, Buckeye fans would not be discussing how close Michigan came to getting him. Anyways, Kyle is a tremendous commitment for Michigan...which is already stacked pretty well at offensive line. The recruiting sites all agree that he's 6-5 and around 300-305. The sites are in a bit of disagreement in his rating. Scout tags the lucrative 5-star rating, while the others list him as a 4-star. Scout and Rivals list him as one of the top-25 prospects in the country (and all of the prospects listed above him on Rivals site have a 5-star rating). Some guru ratings like him a lot, some more than others. ESPN's guru was the least impressed saying that he lacks the arm-length needed to be a great pass blocker. However many of the other guru's say he's a big tough guy who likes to hit and just generally loves playing football. Tim at mgoblog does a great job breaking down the guru ratings and comments.